2012/04/09 Let’s go up to the Mt. Nesugata in Shimoda by cablecar! The TV show said it was 23*C or over in this afternoon in Tokyo. Here in Shimoda it's also getting warmer day by day. When I was driving it was too hot inside, so I opened the window. By the way, I took this picture on the riverside near Shimoda train station in this afternoon. There is a cable car going up to the top of mountain, surrounded by Sakura trees and fresh green leaves. In this season a lot of flowers start blooming on the top. Let's try and go to the top by cablecar! 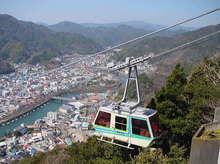 Here is an information of Shimoda cablecar. This entry was posted in Amusement Park, Flower, nature, Travel on 2012年4月9日 by izusakuraya. Today, as my wife had to wok her job my son, Yuuki and I went to the amusement park "Izu Bio Park" in Inatori town. On the way to Inatori I took this picture as usual. This is Shirahama Chuou Beach near Shimoda Prince Hotel. I could see Izu Oshima island clearly today. From Shirahama it takes about 25 mintues by car to Bio Park…. 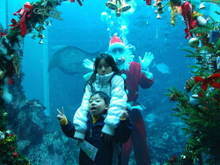 This entry was posted in Amusement Park, beach, Family, Travel on 2007年12月5日 by izusakuraya. "Let’s go to the long slide this afternoon !" After checking out of our guest I said so. My children of course agreed with me, so we went a park in Inatori is called "Fureai no mori" after I finished to clean up the guest room. 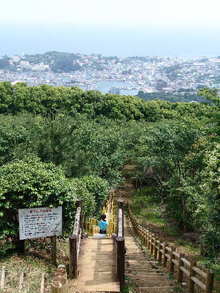 In this park there are many kinds of trees, playground equipments and observatory. Naturally our main purpose was a long slide. The length of this slide is 50 meters. 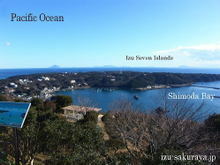 From the top of this slide we can see a beautiful view of Inatori town, pacific ocean and Izu seven islands. As soon as we got there my daughter started to slide down, but it didn’t work well….. This entry was posted in Amusement Park, Family, Travel on 2006年6月4日 by izusakuraya. Today it was rainny and cloudy, and I didn’t take a photo. So I introduce one of Onsen of Izu peninsula. 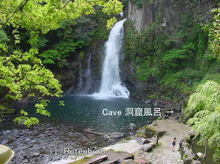 This is a "Oodaru", a biggest fall of Kawazu Seven Falls. In this local area they call a fall "Taru"or "Daru" in Japanese, so Severn Falls is called "Nanadaru". This entry was posted in Amusement Park on 2006年4月29日 by izusakuraya. In spring, we, Japanese have many imagination about it, but one of them is "Strawberry". 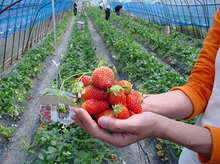 In Izu peninsula there are some places where we can pick strawberrys to eat in a farm. 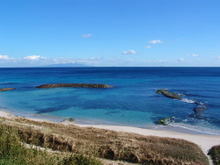 But the nearest place is Minami Izu, "South area of Izu", about 30 minutes by car from Shirahama. We have ever been there for 2 times until now, I’m going to show you some pictures that I took there from my computer….. This entry was posted in Amusement Park, Family on 2006年4月5日 by izusakuraya.